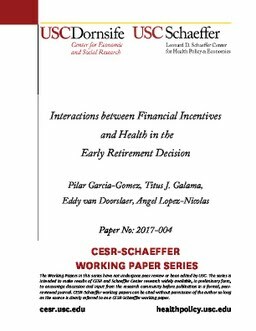 We present a theory of the relation between health and retirement that generates testable predictions regarding the interaction of health, wealth and financial incentives in retirement decisions. The theory predicts (i) that wealthier individuals (compared to poorer individuals) are more likely to retire for health reasons (affordability proposition), and (ii) that health problems make older workers more responsive to financial incentives encouraging retirement (reinforcement proposition). We test these predictions using administrative data on older employees in the Dutch healthcare sector for whom we link adverse health events, proxied by unanticipated hospitalizations, to information on retirement decisions and actual incentives from administrative records of the pension funds. Exploiting unexpected health shocks and quasi-exogenous variation in financial incentives for retirement due to reforms, we account for the endogeneity of health and financial incentives. Making use of the actual individual pension rights diminishes downward bias in estimates of the effect of pension incentives. We find support for our affordability and reinforcement propositions. Both propositions require the benefits function to be convex, as in our data. Our theory and empirical findings highlight the importance of assessing financial incentives for their potential reinforcement of health shocks and point to the possibility that differences in responses to financial incentives and health shocks across countries may relate to whether the benefit function is concave or convex.